With one day of racing behind them, competitors in the 45th BVI Spring Regatta & Sailing Festival rolled right into today’s race, the Scrub Island Invitational – a 12NM upwind ride for the CSA Cruising, Bareboat, and Multihull fleets, and a 17NM course for the CSA-Racing fleet. Conditions were again breezier than expected with 22 knots from the east and bumpy seas for the 10am start. 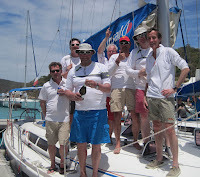 Located off the north east end of Tortola, Scrub Island is a new race destination for this year’s Spring Festival. A private resort island with classic Caribbean white sand beaches and docks at the ready was a welcome sight for racegoers who, on arrival, didn’t waste any time stripping down to bathing suits and finding their way to the pool-side bar. 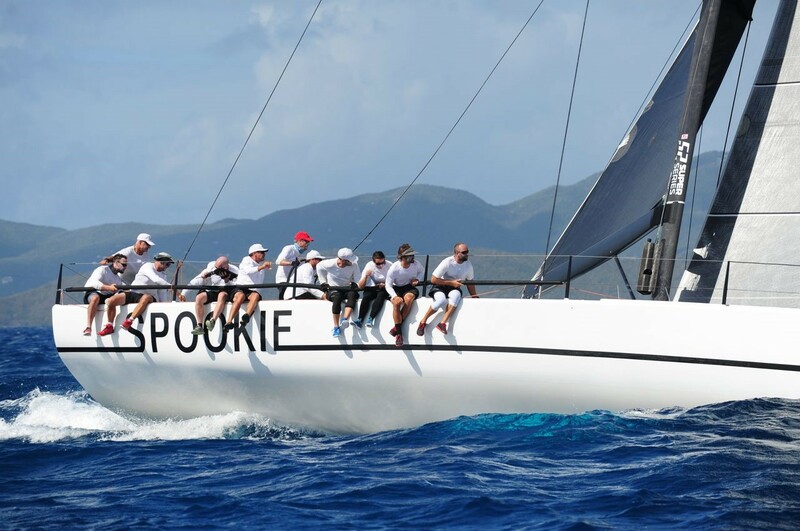 SPOOKIE, the TP52 owned by Steve and Heidi Benjamin (USA), took first in CSA-Racing class, followed by Quokka – Performance Yacht Racing, the Grand Soleil 43 skippered by Christian Reynolds (GBR), and in third place, Northern Child, the Swan 51 skippered by Eric Bos (GBR). Renato Faria (BRA) helmed his Dufour 500 Ventaneiro 3 to another first place today, in the CSA-Cruising class, all the while claiming his boat really isn’t that fast, it’s his fabulous crew. Windward Spirit, the Jeanneau 54DS skippered by Serge Bisson (CAN) took second in the CSA-Cruising class, and Sam of Hamble, a Sigma 38 helmed by Peter Hopps (GBR), took third. First place in the multihull division was Slow Motion, skippered by Werner Puche (GER), while the Outremer 51 Ten Directions, skippered by Glenn Davis (USA), took second. Puche and his family - wife Erena and sons Leon (11) and Robert (9), who are just learning to sail, are having a blast in the BVI. Taking another win today in CSA-Bareboat was Warvor, helmed by Willem Ellemeet (NLD). 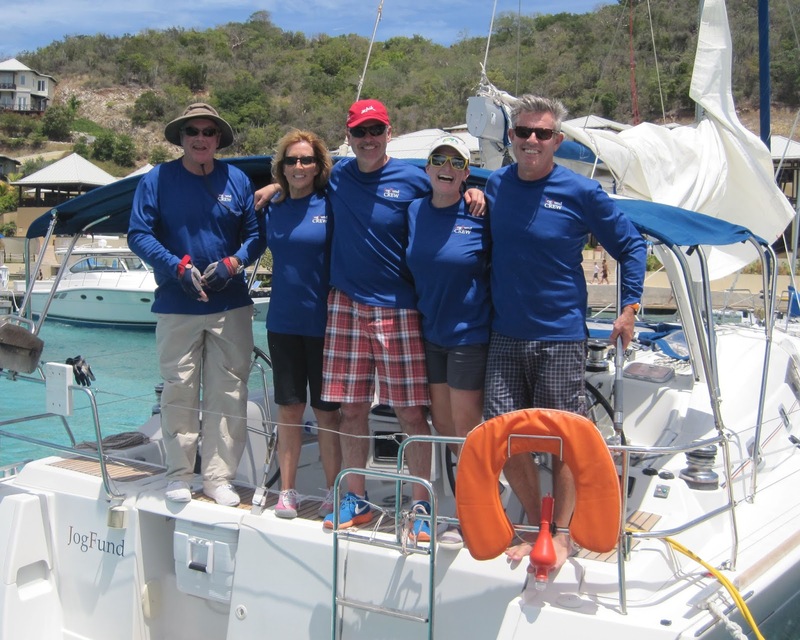 This group of seven friends celebrated their win with a bottle of champagne on the dock on arrival at Scrub Island. Mary Jewell, the Sunsail 50 skippered by Larry Caillouet (USA), took second in CSA-Bareboat, while ACTIFORCE-Ivoire (NLD), a Moorings 51, skippered by Willem Klomp, took third place in class. Looking out to the start of the Regatta on Friday, Warwick Dunnett (USA), skipper of the Beneteau Oceanis 50 JogFund, is grateful for the practice racing over the past two days. Thursday is an official lay-day but there’ll be plenty happening at Nanny Cay, host for the Spring Regatta and Sailing Festival, with the Maritime Heritage Day featuring VP Banks 3rd Annual Tortola Sloop Spring Challenge - traditional Virgin Islands sloops competing for prizes and honours - starting at 11am, and presentation of the Sloop Awards following racing. The Regatta Skipper’s Meeting is at 5:30pm. 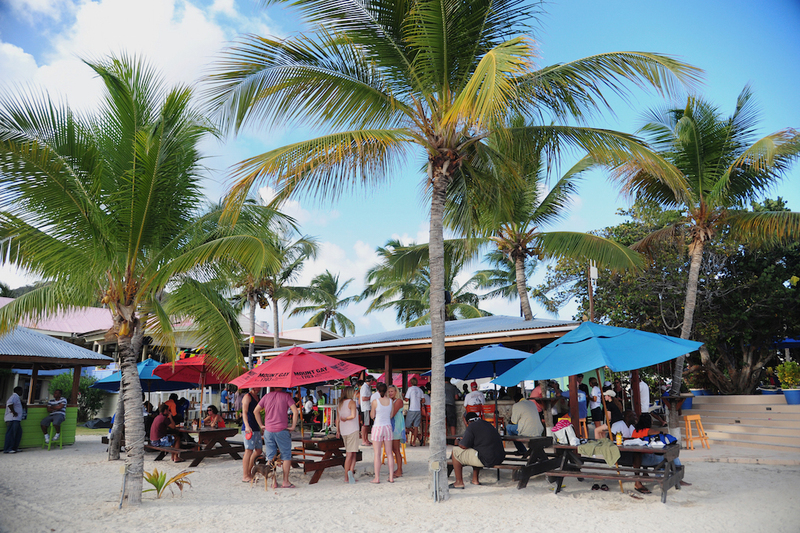 The Mt Gay Welcome party kicks off 5-7pm, with live music – the MJ Blues Band - until midnight. The BVI Sailing Festival Round Tortola Race for the Nanny Cay Cup and Nanny Cay Challenge started promptly at 9:30 on Tuesday morning in seas a little rougher than normal due to last week’s high winds, and an easterly breeze of 18+ knots. The trimaran Triple Jack, owned by Richard Wooldridge and Steve Davis (BVI), charged off the start to an early lead in the CSA-Multihull class, making its way around the island in corrected time of 3:46:38, taking first place overall in the 2016 Nanny Cay Cup. Their elapsed time of 3:19:30 was not enough, however, to break the current multihull record for the Nanny Cay Challenge of 2:33:40 which they set on April 30, 2015, nonetheless spirits were still high on the custom-design trimaran. Penalized by an over early in the start of the CSA Racing Class was not enough to hold back TP52 SPOOKIE, owned by Steve and Heidi Benjamin (USA), from taking first in class in the Nanny Cay Cup in corrected time of 3:48:43. 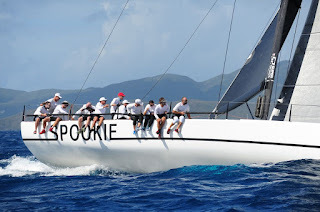 Most significantly, however, SPOOKIE broke the Monohull Nanny Cay Challenge record in an elapsed time of 3:08:43, a whopping 21 minutes off the previous record of 03:29:44, set in March 2013 by Peter Corr’s Aiyana, an Alia 82. With a new record under his belt, Steve Benjamin, SPOOKIE’s skipper, was one happy guy when his boat pulled into the dock after a fantastic ride around Tortola. The team will certainly enjoy their Nanny Cay Challenge prize: a jeroboam of “Drappier” champagne, sponsored by Tico, a BVI distributor, dinner for 15 crew at Peg Legs restaurant at Nanny Cay, and a donation of $250 to benefit BVI youth sailing, which the team has generously matched. In the Racing class, John Bamberger’s Canadian Farr 45 Spitfire was also over early at the start, having to return to the line along with SPOOKIE, while the remainder of the 11-strong fleet took off in a tight bunch. TP52 Team Magnitude – Conviction, skippered by Doug Baker (USA) initially took the lead before being caught by SPOOKIE and finishing second in class. 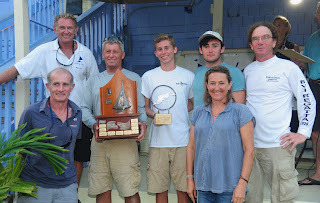 Quokka-Performance Yacht Charters, the Grand Soleil 43 skippered by Christian Reynolds, took third. Renato Faria (BRA) steered his Dufour 500 Ventaneiro 3, to an early lead and first place in the CSA Cruising Class, while Warvor, the Sunsail 44i skippered by Willem Ellemeet (NED) took first in CSA Bareboat. Life couldn't be more perfect for the crews of 54 boats competing in Tuesday's Nanny Cay Cup (Round Tortola Race) with the breeze forecast in the upper teens for the first race day of the 45th BVI Spring Regatta & Sailing Festival. Registration opened at noon today under blue sunny skies, the famed BVI trades keeping the heat at bay. 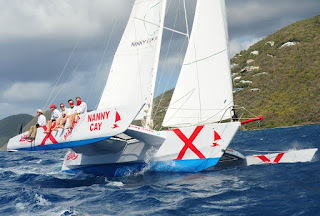 The Nanny Cay Cup not only sets the scene for a week of great racing with spectacular views of Tortola throughout the 31-nautical mile race, additionally, the teams can also race for the Nanny Cay Challenge - a perpetual challenge for the fastest mono and catamaran record around the island. For racers to set a new elapsed time as they make the circumnavigation, starting and finishing at Nanny Cay, they must beat current records: Monohull record (3hrs 29mins 44secs) set at the 2013 Sailing Festival by Peter Corr's Aiyana, an Alia 82; Multihull record (2hrs 33mins 40secs) set in 2015 by BVI's Triple Jack, the trimaran owned by Richard Wooldridge and Steve Davis. The Challenge has fantastic awards up for grabs if a team breaks either of the current records: a jeroboam of "Drappier" champagne, sponsored by Tico, dinner for 15 crew, and a suggestion to donate $250 towards a BVI charity of choice. Spookie, winner of the 2015 Nanny Cay Cup, a Carkeek HP40 owned by Steve and Heidi Benjamin from Norwalk, CT (USA), is back with high hopes to retain the Cup. They are psyched to put their best effort into taking the monohull Challenge record. Racing with them is Olympic silver medalist Peter Holmberg, one of the Caribbean's best known sailors who may help them set that record. Either way, the 15-strong Spookie crew loves the sailing conditions, scenery and atmosphere at Spring Regatta, especially when it's snowing back home. Possibly the youngest sailors in Tuesday's fleet are Leon (11) and Robert Puche (10), all the way from Berlin, Germany. Their dad Werner will be skippering the Leopard 48 Slow Motion, which he bought 18 months ago to keep based in Tortola so they can enjoy events like Spring Regatta. "We're really looking forward to racing here and are only disappointed in that we have to leave early as the kids have to be back in school next week," Werner said. 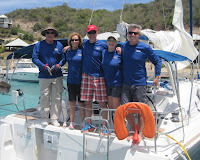 This is the first time for the family to be at the BVI Spring Regatta. More first timers, Renato Faria, from Brazil, will be racing his Dufour 500 Ventaneiro 3, with friends from Brazil and Germany. A harbor pilot from Rio de Janeiro, Faria is used to sailing various Olympic class boats so he's not sure how racing Ventaneiro 3 will work out. "She's really a cruiser, but we'll try to race with her - we're looking forward to the best racing in the Caribbean and will keep the boat here to cruise and race in the future." Team Slovakia, on board Arthur, a Beneteau First 40, have been in town for a few days now, taking time to soak up the beaches and a few cocktails while getting to know their way around the prevailing conditions. The group of seven friends are under the tutelage of Spring Regatta veteran Chris "Jacko" Jackson, owner's rep for Arthur. "This is a great regatta for these guys," Jackson said, "Everything's in one location, it's a two-minute walk to the parties from the boat, flat water and great sailing - what more could they want?" Bob Phillips, Regatta Chairman, has chaired the BVI Spring Regatta and Sailing Festival for 19 years so has a pretty good idea how conditions may shape up tomorrow. "We're looking at 15-20, pretty usual trade winds, maybe a little higher than normal. Of more importance is the direction - usually it's from the east which means a dead beat for the first part of the race...may not be record breaking conditions but it'll be close!" Registration opens Monday at Nanny Cay, Tortola, British Virgin Islands, for some 110 boats and crews in the 45th BVI Spring Regatta & Sailing Festival. The buzz is building shore-side, with the event Village under construction and docks filling up. 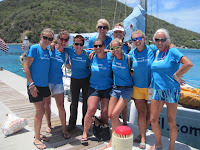 Lucy Jones, owner of the Swan 51 Northern Child & the Beneteau First 40 Southern Child, is back for her 7th BVI Spring Regatta & Sailing Festival with two new race charter crews: a group of 24 from the company Samsin has chartered Northern Child & will race 12 guests on, 12 off, throughout the week. Tony Mac & his Team McFly have chartered the First 40. Bamberger bought Spitfire in England last year and transferred her to the Caribbean a few weeks ago to participate in the Caribbean 600, and now this week, the BVI Spring Regatta & Sailing Festival. Christian Reynolds, a director of Performance Yacht Racing, is no stranger to the event, here for his 6th. One aspect of the event he welcomes is that the BVI Spring Regatta offers up some flat water racing, unlike other Caribbean racing. “The Sailing Festival is the “fun racing” and the Regatta is more serious – that mix is good, not to mention, it’s stunning here,” Reynolds says.